The 3M™ Littmann® Electronic Stethoscope Model 3200 delivers both exceptional sound quality and a simple-to-operate user interface. With these sound and usability improvements, you might never go back to your old stethoscope. 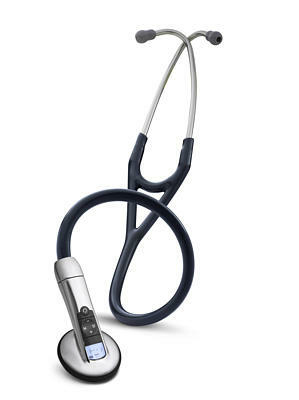 The new Littmann Model 3200 offers on-board recording and playback capabilities, Bluetooth® technology to wirelessly transfer sounds to your PC for further analysis, free heart & lung sound visualization software, and available software that identifies suspected heart murmurs with a Class I indication. Actual tubing color may vary slightly from the color on your screen due to computer and device screen resolution differences.